Explore Colombia’s archeological and cultural roots: the pre-Colombian statues of San Augustin and the historic town of Popayán. Embark on a four-day trek through an astonishing array of sacred geography as you traverse rainforest river valleys to climb to high altitude lakes and páramo ecosystems. End with a scenic drive across a massif to see vast canyons in every direction as you journey to stay overnight in the colonial town of Popayán, the gateway to the “Macizo colombiano” (Colombian Massif). Today, in San Agustín, discover Colombia’s #1 visited archeological site. Your bilingual guide meets you at 8 am at your hotel and you take a short drive to the Archaeological Park of San Agustín. Enjoy a walking tour as your guide interprets the art and archeology of pre-Colombian statues in the Forest of Statues. Walk to the straights of the Magdalena, where the great Magdalena River is only 3 meters in width when it is normally one of the country’s largest rivers. Visit Lavapatas Fountain, a ceremonial sacred site where set of carved rocks rests on the bed of the creek. See water carried up to three ponds by the spirited silhouettes of snakes, lizards, and the mythical cults that worshipped water. In the afternoon, visit the museum and craft shop in Obando, Alto de los Ídolos y Piedras, Salto de Bordones, and Trapiches Paneleros. In the afternoon, your guide helps you pack and prepare for your 4-day trek. Return to your comfortable hotel, within walking distance to delicious restaurant options, for a relaxing evening prior to your early morning hike. Your 4-day trek begins today with a stunning hike to the Páramo de las Papas, a spectacular high-altitude desert ecosystem. To get to the Quinchana trailhead, take a scenic drive in a 4 by 4 jeep on 30 kilometers of unpaved road. In Quinchana, enjoy breakfast prepared by the farmers of the area and take a locally packed lunch for the day. Your 21-km trek may take your group approximately 7 hours. The walk begins at 1680 meters until reaching the village of San Antonio, located at 2350 meters. 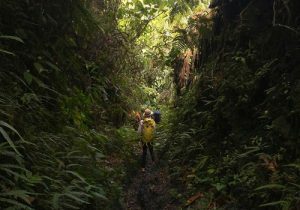 The Quinchana trail has jungle sections along the Magdalena River, so be sure to have solid hiking boots and hiking poles. Within a few hours of the trek, cross over a bridge over Magdalena River and walk up a creek to reach a beautiful ridge, where you can see beautiful views of Rio Magdalena valley and canyons. Enjoy lunch here before walking a few more hours before you reach the village of San Antonio. Stay overnight in simple, comfortable beds in humble village houses and dine with locals you try traditional food prepared by your guide and local cooks. Start today’s trek from San Antonio and climb to Laguna de la Magdalena, the source of the mighty Magdalena river. Today, you’ll need to have a rain jacket, warmer layers, and a warm hat easily accessible. You’ll climb to 3327 meters and then descend to Vereda La Hoyola at about 3140 meters. Your total hike today is 19 kilometers and will take your group approximately 7 hours. Today, you’ll see the central mountain range and the eastern mountain ranges of the Huila department. Stay overnight in a village near the lake in simple and humble houses, where you try traditional food prepared by your guide and local cooks. 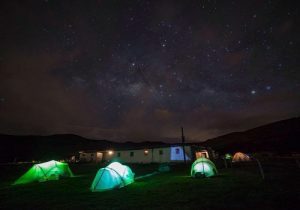 At this altitude it is cold, so you will be advised to bring your own sleeping bag or rent one from Expedition Colombia in advance for an additional cost. Have your camera handy today as you hike the spectacular La Hoyola trail for incredible views. Depending on how your group feels, choose between a grade 4 to the viewpoint of Santiago Lake, or a grade 3 hike to the Cusiyako Lake. Stay overnight in a village near the lake in simple and humble houses, where you try traditional food prepared by your guide and local cooks. Today enjoy a shorter 4 km walk to Corregimiento de Valencia of the Municipality of Cauca. Here, a van meets you to the historic city of Popayán. The 130-km drive to the town takes approximately 5 hours, but the journey is worth it for the scenery along the way. Carve through impressive canyons of the Colombian massif and gain a greater understanding of the department’s striking geography. Upon arrival at your hotel in the historic neighborhood of Popayán, enjoy a relaxing evening dining in one of the town’s many excellent restaurants. UNESCO appointed Popayán as a City of Gastronomy due to its many culinary specialties, such as the “empanadas de Pipian”, as well as the many international and vegetarian food options. The roots of the pre-Columbian culture, African culture and Spanish cuisine blend together to create unique flavors and specialties in this vibrant “foodie” city. Extend your trip by 1 days and 1 night for a city tour. Tour the historic city of Popayán. This town is considered one of the most beautiful and well-preserved colonial towns in Latin America. Discover the UNESCO “creative city” lined with Spanish style cathedrals, colonial plazas, and lively universities. For lunch, enjoy the local cuisine of Popayán and the symbolism, rites, legends and customs that come along with the food. Let us know in advance if you’d like us to arrange your transport, for an additional cost, from Popayán to Popayan Guillermo Leon Valencia Airport (PPN / SKPP) or Gustavo Artunduaga Paredes Airport (near San Agustin). For additional convenience, have us arrange all your travel needs to San Agustín and from Popayan. We can arrange your flight from Bogota, or Medellin, to the Gustavo Artunduaga Paredes Airport in Pitalito. Your guide meets you in the airport for a 1 hour transfer to your hotel in San Agustín. Otherwise, from Medellin, you may take our private van and bilingual driver for a 16-hour drive to San Agustín. Please ask to arrange this option ahead of time at the time when you book the trip. We pride ourselves in providing unique experiences and believe every traveler is unique and deserves customization.